The first time I read this wonderful work, it was the late 1970’s and I was in the Army stationed overseas. Looking back now, I could say that this work initiated a long journey into nondual inquiry. It addressed several questions that I was asking as a rather intellectual young man trying to understand my place in the world. What is the relation between the idea and the object? Although Blanshard’s two volumes contain over 1100 pages of philosophy, I’m pleased to say that my time with them has always been enjoyable and illuminating. The author, Brand Blanshard, is known as one of the most lucid philosophical stylists in English. Blanshard worked on “The Nature of Thought” throughout the 1920s and 1930s. During those decades, the grand metaphysical theories of previous centuries were under attack by more recent innovations, such as Darwin’s evolutionary theory, Freud’s psychoanalysis, and the new logical positivism that sought to reduce philosophical questions to matters of language and logic. Blanshard’s stated purpose in the book is to defend the older philosophical ideals, such as reason, truth, knowledge, the nature of objects, and the relationship between mind and reality. He offers a superbly reasoned account of the full range of cognitive experience, including perception, observation, thinghood, association, reflection, inference, ideas, relations, causality, similarity, sameness, difference, necessity and truth. The book ends with an account of a fully realized system that integrates knowledge and being. It’s classic old-school Anglo-American systematic philosophy, and one of the last works of its kind. Twenty-five years later, Blanshard’s culture would be dealing with the cynicism of the post-JFK, post-MLK Vietnam era. Philosophy took on a more technical, critical, deconstructive turn, and systematic philosophical works would become rare. Looking back at “The Nature of Thought” after all these years, I appreciate all over again how much help it’s given me in nondual inquiry. The four questions I struggled with in the 1970s are classic topics of inquiry. They correspond to some of the most rigid dualisms that we encounter. They were my dualisms. I felt them deeply, the way Zen students are told to feel about their koans. And in each case, Blanshard’s virtuoso treatment of the topic served to pacify my dualistic impulses. I’ll take up each topic in turn. I had always thought that a thing possessed a truly existent core identity. The job of this core identity, I thought, was to make a thing be what it is, and not something else. The core had attributes that can come and go, I thought. But the core was the true nature of the thing. Classic dualism! But Blanshard subjects this notion to withering criticism. For him, a thing is nothing more than repeatable qualities with no core whatsoever. No core is needed, and none can be found. Up until reading this book, I had always been a Cartesian. I was convinced that ideas were in the mind and the mind was in the body. And of course the world of objects was outside. I wasn’t sure how all this worked, but I was pretty sure that ideas were made of one substance, and objects were made of something else. Objects were always more mysterious to me. What would they be made of? I thought that somewhere underneath the subatomic particles, objects were made of that core identity responsible for keeping things straight. That was another classic dualism — idea and object. With my assumptions, I was totally mystified by how the mind could know anything about the world. For me, this was the stickiest dualism of all. What is the relation between idea and object? Blanshard is brilliant on this point. He examines a wide range of theories and finds that they all fail to account for something essential. He looks at the idea as image, as language, as behavior, as mental event and psychological process. He argues that none of these models makes it possible for ideas to provide knowledge of objects. His own theory collapses the dualism conveyed by all these other theories. The “idea-to-object” relation is not a matter of different essences matching up together, he argues, but a matter of DEGREE. The relation is from potential to actual. The idea is the object partially realized. The object is the idea fully realized. They are the same and different at once. I was startled and thrilled to read this for the first time. I grew up assuming the mind and the world were separate. But I found Blanshard’s account so sensible, my Cartesianism vanished and never returned. Blanshard argues that truth is the coherence among our various ideas. As a judgment is integrated into a larger and more coherent system of thought, the more closely it approximate “truth.” A “false” idea is one that doesn’t cohere as well as its opposite. 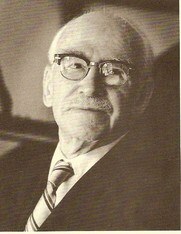 Over the years, Blanshard has been regarded as one of the major authorities on the coherence theory. Before encountering Blanshard’s work, I had always accepted the more common theory, which says that truth consists of an idea matching or corresponding to a bit of reality in the world. In fact, it’s called the “correspondence theory” of truth. But before reading The Nature of Thought, I had never examined just how correspondence was supposed to work. In fact, one of Blanshard’s principal arguments for the coherence theory is that the correspondence theory can’t work as it claims to. We can’t ever be in the position to adjudicate how a judgment corresponds to an orange. We can’t verify whether correspondence is even taking place. The other argument is based on what we do when we try to ascertain the truth of a judgment. We check how well or poorly the judgment is supported by related judgments and observations. We ascertain how well the judgment coheres with other judgments and with the existing structures of experience. In other words, even if we wish to define truth as correspondence, in practice it is coherence. I had encountered the coherence model of truth in an earlier reading Hegel. But Blanshard’s exposition is crystal clear. I found the coherence model to have a simple logic as well as an almost aesthetic appeal. Of course this short discussion can’t settle the controversy between the coherence-vs-correspondence debate, but I found the coherence model to assist in deconstructing the mind/world dualism I’ve always felt to be entailed by the correspondence model. When I asked this, I was wondering about relationships. What’s the relationship between myself and the world? Blanshard’s book never answered this directly, but he articulates a theory that answers it by implication. His theory is called “internal relations.” To oversimplify it, I’d say it holds that everything is related to everything else. If anything related to an object changes, then that object changes at least a little bit. The theory of Internal relations is a critique of another theory called “external relations,” which holds that some properties of an object are “external” to it and can change without the object changing. Other properties are “internal” or essential to it, and if they change, the object changes. The theory of external relations proposes a strict dichotomy between types of qualities that objects have. Some are supposedly internal and essential, and others are external and dispensable. I had believed this notion in a vague way for much of my life. But between the two types of qualities, I certainly wouldn’t have known where to draw the line. Of all Blanshard’s ideas in “The Nature of Thought,” the idea of internal relations is the one that he is the most passionate about. It seems similar to the first notion I described above, the notion that an object has no essential core. That idea characterizes a particular object, whereas the theory of internal relations is like the “international version,” and pertains to the object’s relations to everything else. When I read this theory back in the late 1970’s, I was again struck by a sort of nondual logical simplicity combined with a beautiful sense of generosity. I felt that if I saw everything in the world, including myself, as internally related, then I couldn’t be truly separate. The theory of Internal relations articulates a notion of relationality that is quite similar to the Buddhist idea of interdependence. Though I’ve never seen any evidence that Blanshard was influenced by Buddhism, his vision is strikingly similar to the Buddhist concept of interdependence. For example, in Thich Nhat Hanh’s “Interbeing” meditation, we come to see the whole world a single sheet of paper. 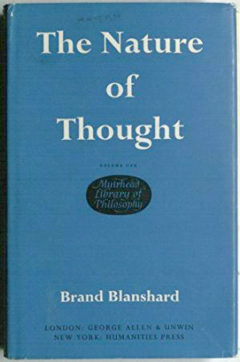 The “Nature of Thought” is Blanshard’s first major book. He went on to write for almost another half-century. His ideas changed over the years, but he was always an advocate of reason, of grace in discussion, that the inter-relatedness of things. It seems to me that these qualities by themselves could help us carry nondual inquiry to a successful conclusion. But in the excellent company of “The Nature of Thought,” the process is sure to be much more pleasant. An object is an idea in a form. (Tables, I phones, roads, cars, etc.) the name given expresses in the most simplest way the relation this idea has with this form. This name, this idea, this form and this purpose or function. An idea is the opportunity to see a landscape unfold. (psychoanalysis, The USA, etc.) Ideas are generative, they generate the unfolding of landscapes. And they can be in many cases what I call more or less functional illusions which may have more or less value and validity in relation to ever changing contexts. A map for example is not the territory, it is a more or less functional illusions, and so is Canada, The USA. To think within a framework (American framework as example), is to inhabit this framework, to look from it, and to look at the ‘corresponding’ landscape or dream unfold. An Idea is a way of seeing, way as in sets of directives and instructions like our GPS. A what, where and how to look. (theories, hypothesis) looking for to look from and looking for to look at, it is intent, the intent to look from a specific lens in order to be able to look at a ‘clear and distinct’ particularity. The core of any object is the idea in potential. That core being extended consciousness. A road is inert meaningless black tar (matter) with a purpose; driving our car on it. Almost all in our Megalopolis is of this extended consciousness; inert matter with purpose. And it is all about us and of us. Cities are worlds made up of words ideas, and so is Canada, the USA, etc. More or less functional illusions. The centrality or core of just about anything has to do with us. An apple is not an apple, that is why we name it an apple. Stone, no dog, dog no stone (in reference to a statue of a dog made up of stone). The what it is, is this extended consciousness ‘part’, there is no what it is, without this extended consciousness. What it is ask for something, and that something is a specificity. To specifically specifies a specificity (specific patterns of colors as example) is what we mean by naming and is what we mean by things or objects. There are no objects or things, those are generics and generative; extended consciousness. The question whether there is such a thing as a thing in itself, or a core to a thing collapses entirely. Ideas therefore are the eyes of unity, as they gather what we look from to what we look at and vice versa.